Choose exercises that keep your heart rate elevated. Shedding body fat requires you to consistently expend more calories than you consume. You can accomplish this by eating a low-calorie diet while doing workouts that encourage total-body fat loss. High-intensity aerobics quickly elevate your heart rate, make you break a sweat and burn lots of calories. Strength-training workouts build muscle throughout your body, which helps to increase your calorie-burning potential. Choose aerobic activities that burn at least 500 calories per hour while regularly strength training your upper and lower body to shed fat and stay trim. Running is a high-impact activity that burns more calories than most cardiovascular exercises. According to Harvard Health Publications, you can burn between 300 to more than 600 calories per hour running at a moderate speed. 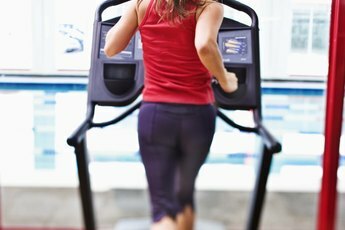 Whether you run on a treadmill or throughout your neighborhood, the approximate number of calories you burn will be the same. Running also builds endurance and stamina, allowing you to run for longer distances and burn even more calories as your cardiovascular fitness builds. Run for 45 to 60 minutes daily to shed pounds and stay healthy. Swimming is a high-intensity activity that burns hundreds of calories per hour without straining your knees or joints. 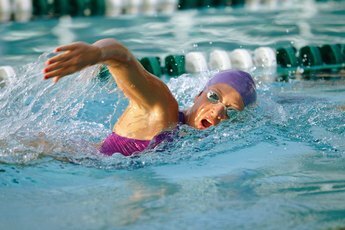 According to Harvard Health Publications, a 155-pound person can burn more than 200 calories swimming moderately for 30 minutes and almost 400 calories in that same time frame swimming vigorously. Swimming also tones and lengthens muscles in your back, shoulders, arms, torso and legs, providing a full-body workout. It is an activity that most people can perform comfortably, despite limitations due to being overweight or having a joint injury. If you can access a pool, swim two to three times weekly for at least 30 minutes to burn fat while toning your body. Cycling is a low-impact exercise that burns calories while toning your glutes and the muscles throughout your legs. A 185-pound person can burn more than 600 calories per hour cycling moderately and more than 900 calories per hour cycling vigorously, notes Harvard Health Publications. You'll achieve similar benefits whether you ride a bicycle through your neighborhood or a stationary cycle at the gym. The repetitive movement of cycling without impact also keeps your joints mobile, which makes cycling an ideal workout for individuals with bone or joint ailments. Cycle for 30 minutes or more at least five times weekly for a low-impact cardiovascular workout that burns a lot of calories. Because muscle burns more calories than fat, incorporating strength-training workouts into your exercise routine allows you to shed more fat than you would with cardiovascular exercise alone. Strength training also enhances muscular endurance, making it possible for your muscles to sustain you during aerobic and other physical activities. Lunges, squats, pushups, chest dips and situps are examples of upper- and lower-body strength-training exercises that you can do. Strength train for at least 30 minutes four times weekly to activate your muscles and burn more calories, and always alternate between upper- and lower-body workouts each time you strength train to give your muscles time to recover. 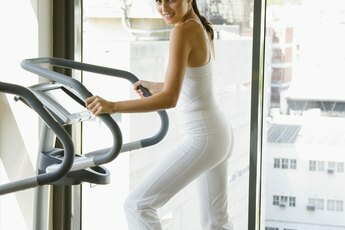 BodyBuilding.com: Which Cardio Methods Melt Fat the Fastest?